UK startup and world-leading fuel cell engineering company Intelligent Energy is set to launch a new hydrogen fuel cell at AUVSI Xponential 2019 later this month. The 2.4kW fuel cell is designed for the commercial UAV market. In the past eighteen months, Intelligent Energy has launched four products for commercial drones. All aim to provide a solution to the constraints of LiPo batteries. Instead, the company’s solutions promise minimum downtime, fast refuel, and superior flight times. Recently, Intelligent Energy’s 800W Fuel Cell Power Module was used to achieve a new Guinness World Record for the longest multi-rotor flight time. The flight was conducted by South Korean company MetaVista. The drone flew for 12 hours, 7 minutes and 5 seconds using liquid hydrogen to fuel the module. The previous record stood at 2 hours, 6 minutes 7 seconds. 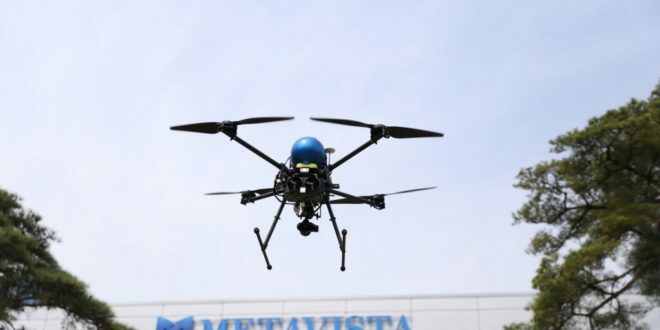 MetaVista carried out the record-breaking flight. A 380% increase in DJI M600 Flight Time? Two 2.4kW modules can also be linked in parallel to provide up to 4.8kW of power without the need for additional hardware. The module provides continuous power to the UAV and is hybridised with a small battery to manage the peak loads. The module can be fitted onto a number of off the shelf frames, however, efficiencies and flight time can be optimised further still on a customised frame. Visitors to AUVSI Xponential will be able to see the full range of Intelligent Energy’s Fuel Cell Power Modules on stand number 3413 and speak to the team. Intelligent Energy’s Andy Kelly, head of UAV product development, will be speaking on Tuesday 30 April at 11 am. The talk is entitled: Beyond Batteries: How Fuel Cells Offer a Viable Solution to Current Flight Time Constraints of Traditional Power Sources.